$40M Menil Drawing Institute set for Nov. opening $40M Menil Drawing Institute set for Nov. opening https://www.recenter.tamu.edu/news/newstalk-texas/?Item=20042 2018-05-07T05:00:00Z 2018-05-07T21:35:00Z ​ HOUSTON – The Menil Collection has announced that the 30,150-sf Menil Drawing Institute will open in November 2018. The $40 million facility will be the first freestanding museum facility created specifically for the exhibition, study, storage, and conservation of modern and contemporary drawings. 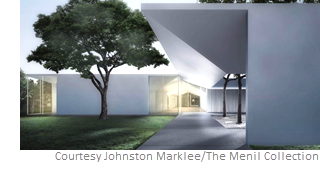 It will be the fifth art building on the Menil's 30-acre campus, joining the main museum building, the Cy Twombly Gallery, the Dan Flavin installation at Richmond Hall, and the Byzantine Fresco Chapel.